Cooper is committed to making rental solutions easy for you – and that means establishing growth plans that allow us to bring branches close to you. 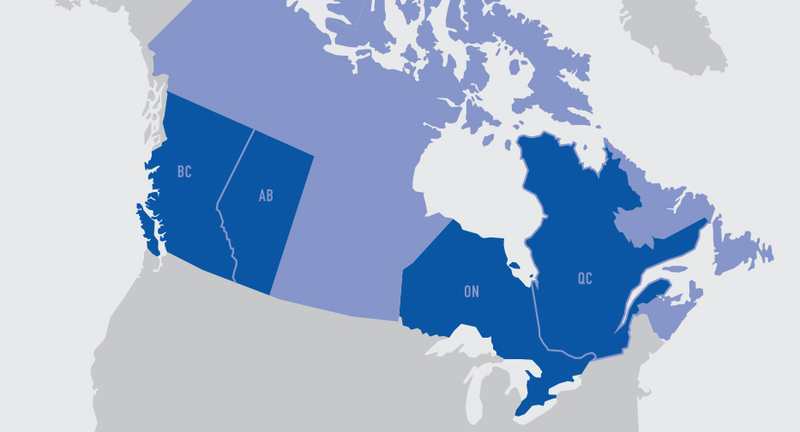 With locations all across Canada, we are excited to bring The Cooper Difference of safety, reliability and on-time delivery Canada wide. We are excited to announce that Cooper Equipment Rentals has acquired Star Rentals. With the acquisition of Star Rentals, the largest independent equipment rental company in the Lower Mainland of British Columbia, we will now have services in the Metro Vancouver area in White Rock, Surrey, Langley, Abbotsford, and Burnaby! We welcome BC into our Cooper Family and we look forward to delivering The Cooper Difference to all customers across the Lower Mainland. Cooper Equipment Rentals expanded further into Alberta in 2019 with the acquisition of Prime Rentals. Cooper Equipment Rentals now has a location in Taber and a second location in Lethbridge, Alberta. In 2018 – Cooper Equipment Rentals acquired Modern Industrial Equipment with locations in Calgary and Medicine Hat. Their first step into Alberta was in 2017 with the acquisition of 4 Way Equipment Rentals and Alberta Lift who had locations in Edmonton and Calgary. With our locations in Edmonton, Calgary, Lethbridge, Medicine Hat and Taber, equipment rentals in Alberta has never been easier. Ontario is home for us, it’s where Cooper originated. That’s why our growth strategy began with expansion all across Ontario. From Northern to Southern Ontario, we’ve got you covered. We also have specialty branches and a specialty division in Ontario – the Aerial Branch, the Heating Branch, the Heavy Equipment Branch and the Trench Safety Division. These branches are dedicated to providing expert equipment solutions to any type of project. In 2016 – Cooper expanded into the Quebec marketplace with a branch in Brossard and a branch in Montreal. General tools, heavy, compact or aerial equipment – we’ve got it all. Your Cooper rep will work 1-1 with you to determine the best equipment rental solution for your job.